Asparagus or garden asparagus, scientific name Asparagus officinalis. Asparagus is a spring vegetable, a flowering perennial plant species in the genus Asparagus. It was once classified in the lily family, like its Allium cousins, onions and garlic, but the Liliaceae have been split and the onion-like plants are now in the family Amaryllidaceae and asparagus in the Asparagaceae. Asparagus officinalis is native to most of Europe, northern Africa and western Asia, and is widely cultivated as a vegetable crop. This spear vegetable is now grown as a major commercial crop in China, Europe, Peru, Australia, and USA. 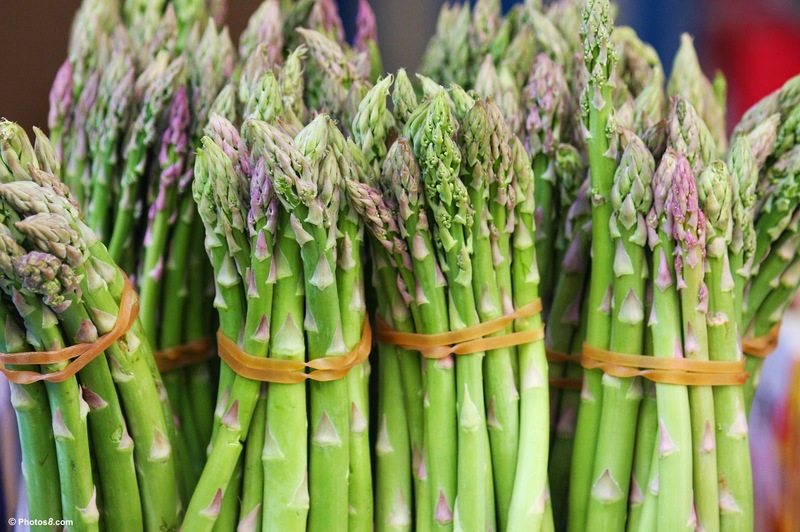 Although it’s available all year round, asparagus usually is most found and best in spring and is harvested when it is about 6 to 8 inches tall. The variety we eat is usually green or greenish purple in color. There is also a white variety which is grown underground to preserve its delicate flavor. But these sunlight-deprived stalks also lack the goodness of chlorophyll. 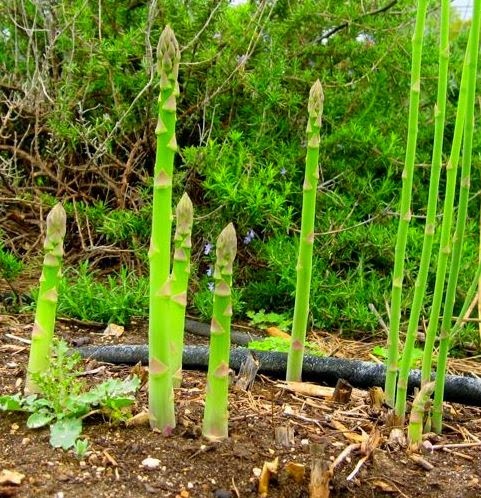 To cultivate, asparagus crowns are planted by early spring grows into tall branched stems bearing fine fern-like green needles (phylloclades) giving the plant an overall feathery appearance. The plant can also be established by transplanting of 10-12 week-old seedlings or direct seeding. A fully-grown plant reaches about 5 feet in height. Young scaly edible spears emerge from the extensive matted root systems, which are ready for harvesting by early spring. Warm weather makes the spears tip to open prematurely, which may reduce their flavor and quality. Asparagus is normally harvested once a year over a 8 to 10 week period. Perhaps it may surprise you that there are a few hundred varieties of asparagus but only a small number is edible. Asparagus is expensive compared to other more common vegetables simply because it is harvested by hand. Asparagus has been revered since ancient times by Greeks and Romans as a prized delicacy. Asparagus has been used as a vegetable and medicine, owing to its delicate flavour, diuretic properties, and more. Asparagus is an alkaline food which is rich in protein but low in calories and carbohydrates. It is an excellent source of potassium, folate, vitamins A, C and K, and traces of vitamin B complex. Asparagus is an excellent source of vitamin B6, calcium, zinc and magnesium. Asparagus also contains relatively high levels of beta-carotene, vitamin C, vitamin E, thiamin, riboflavin, rutin, folic acid, iron, copper, potassium, selenium and manganese. A good source of dietary fiber, asparagus is also rich in niacin, phosphorus and very low sodium. And certainly most impressive is that it is one of those few vegetables that actually has the calcium and magnesium in the ideal ratio of 2:1. Asparagus has an abundance of an amino acid called asparagine, that helps to cleanse the body of waste material. As a result, some people’s urine may have a foul odor after eating asparagus. Don’t worry if this happens to you. Just be glad that your kidneys are getting a good cleansing. Fresh asparagus also contains fair amounts of anti-oxidant vitamins such as vitamin-C, vitamin-A, and vitamin-E. Regular consumption of foods rich in these vitamins helps the body develop resistance against infectious agents and scavenge harmful, pro-inflammatory free radicals from the body. A unique phytochemical in asparagus that produces anti-inflammatory effect helps relieve arthritis and rheumatism. Yet another amazing thing about the antioxidant glutathione: it helps protect the skin from sun damage and pollution. Dietary fiber in asparagus helps control constipation conditions, decrease bad (LDL) cholesterol levels by binding to it in the intestines, and regulate blood sugar levels. Studies suggest that high-fiber diet help cut down colon-rectal cancer risks by preventing toxic compounds in the food from absorption. Fresh asparagus spears are a good source of anti-oxidants such as lutein, zea-xanthin, carotenes, and crypto-xanthins. Together, these flavonoid compounds help remove harmful oxidant free radicals from the body protect it from possible cancer, neuro-degenerative diseases, and viral infections. Asparagus is a prime source of anti-oxidant and glutathione that can help prevent the dreaded cancer. The anti-oxidant and glutathione in asparagus prevents the progression of cataracts and other eye problems. The healthful minerals in asparagus juice make it an important diet for people who are controlling their blood sugar levels. However, it is not to be taken by people with advanced kidney diseases. Asparagus has excellent anti-inflammatory effects and high levels of antioxidants, both of which may help reduce the risk of heart disease. Drink a small amount of asparagus juice mixed with raw honey three times a day daily to strengthen a weak or enlarged heart. Asparagus is a wonderfully diuretic vegetable and its efficacy is more pronounced when it is taken in juice form. 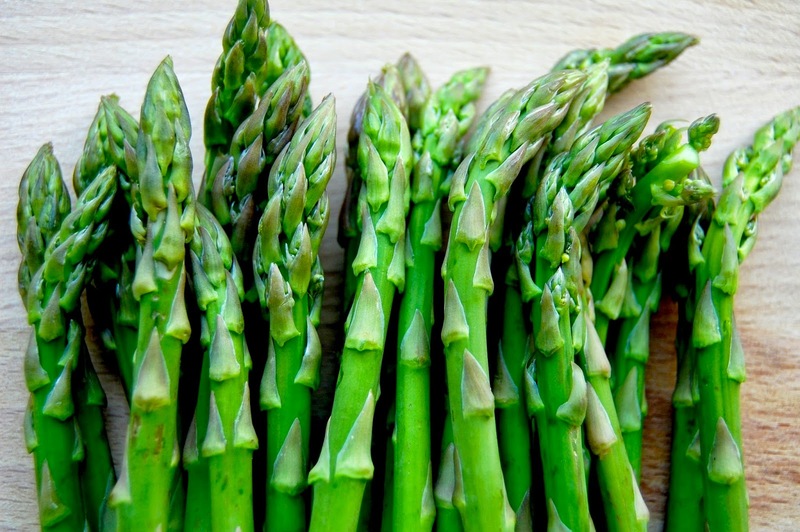 The diuretic and alkaline properties of asparagus help prevent or dissolve kidney stones. It helps break up oxalic acid crystals formed in the kidney. The diuretic effect of asparagus juice helps relieve premenstrual swelling and bloating. The magnesium in this wonder juice also help relieve irritability, fatigue, depression, etc. Fresh asparagus are rich in folates, calcium and other minerals. Scientific studies have shown that adequate consumption of folates in the diet during pre-conception period and during early pregnancy, help prevents neural tube defects in the newborn baby. The diuretic effect of the juice is also a big help in reducing water retention in pregnant women. Asparagus is good in minerals, especially copper and iron. In addition, it has small amounts of some other essential minerals and electrolytes such as calcium, potassium, manganese, and phosphorus. Potassium is an important component of cell and body fluids that helps controlling heart rate and blood pressure by countering effects of sodium. Manganese is used by the body as a co-factor for the antioxidant enzyme, superoxide dismutase. Copper is required in the production of red blood cells. Iron is required for cellular respiration and red blood cell formation. Asparagus is safe when eaten in food amounts. However, there isn't enough information to know if asparagus is safe when used in larger medicinal amounts. Asparagus can cause allergic reactions when eaten as a vegetable or used on the skin. Pregnancy and breast-feeding: Asparagus is UNSAFE to use in medicinal amounts during pregnancy. Asparagus extracts have been used for birth control, so they might harm hormone balances during pregnancy. Allergy to onions, leeks, and related plants: Asparagus might cause an allergic reaction in people who are sensitive to other members of the Liliaceae family including onions, leeks, garlic, and chives.